Sadistic dictator Edgar Lungu says people who don’t want to be tested by force can go to court but assured them that his courts will rule in his favour. Against UN laws, the dictator declared that any person who gets sick and goes to a Zambian hospital must first be tested for HIV or sent back to die at home without treatment. The PF president was speaking to journalists yesterday on departure for Rwanda where he has gone to witness the inauguration of re-elected President Paul Kagame. 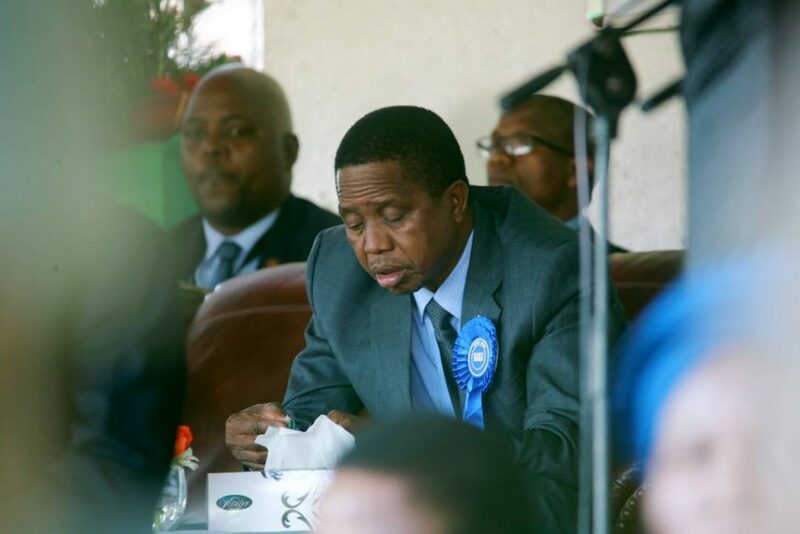 Lungu said people shoild stop lamenting that their human rights were being violated because was concerned about their welfare. The Head of PF said those who want to take the matter to court should proceed as they will certainly lose since he appoints the judges. The Human Rights Commission (HRC) wishes to acknowledge the positive efforts the Government is making towards achieving zero new HIV infections and zero AIDS related deaths but wishes to caution against violating human rights during the course of implementing that vision. The HRC would like to particularly call upon the Government to revisit the recent policy pronouncement on mandatory HIV/AIDS testing because it is in conflict with the internationally agreed principles and practices on reducing the spread of HIV and mitigating the impact of AIDS. The Government is particularly encouraged to adhere to the United Nations (UN) guideline on HIV testing and counselling as atticulated through the joint UN Programme on AIDS (UNAIDS) and the World Health Organisation (WHO) which discourages mandatory HIV/AIDS testing on public health grounds and respect for human rights. “ People being tested for HIV must give informed consent to be tested. They must be informed of the process of HIV Testing and Counselling, the services that will be available depending on the results, and their right to refuse testing. Mandatory or compulsoryt (coerced) testing is never appropriate, regardless of where that coercion comes from: health-care providers, partners, family members, employers or others”. It is therefore regrettable that the Government may be formulating a policy that is in breach of international norms on HIV Testing and Counselling and in multiple violation of human rights such as the right to non-discrimination, bodily integrity, and the right to be free from violation. The Commission notes that while the decision of the Government to introduce mandatory HIV Testing may have been well intended, it has the negative potential of rolling back the fight against the spread of HIV and mitigating the impact of AIDS. Volutary HIV Testing remains the most preferred effective mode of fighting HIV/AIDS because it is anchored on sound public health practice and respect for human rights as guided by the UN through UNAIDS and WHO. The government is therefore urged to scale up investment in HIV/AIDS Counselling in order to promote public awareness, understanding and appreciation of HIV Testing as well as promoting behavioural change and/or positive living. The Government should also scale up the provision of treatment to those who are infected. It is important to appreciate that for sustainable results against the spread of HIV through testing and treatment, due sensitivity should be given to matters of privacy, confidentiality, counselling, autonomy and informed consent. On the other hand, the Commission wishes to encourage everyone to seek HIV/AIDS counselling services and prepare for testing in order to know their status and seek treatment, care and support before it is too late. Needles to stress the fact that that not knowing one’s HIV Status can have damaging consequences, as it puts people at risk of delayed treatment and subsequently, premature death.